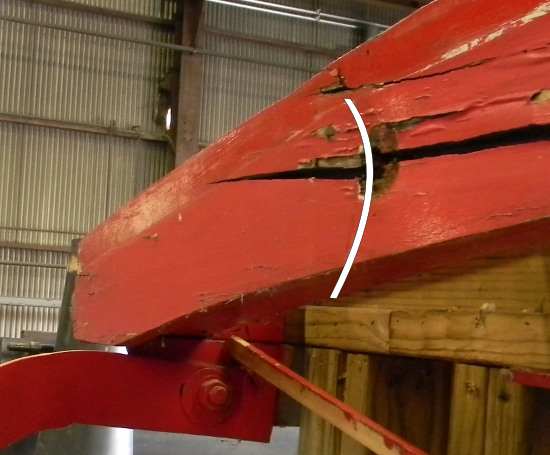 This page is about restoring a wooden Laurinburg and Southern caboose at Knoxville Locomotive Works. The caboose will be available to charter later in 2013, as part of the Rambler train in Knoxville Tn. The Rambler is an attraction open to the public, information is at the link below. Upon removing more wood, I did find substantial steel supports. Some are arched to form the curved roof lines. These pieces of angle iron are 1/4 inch thick, by 3 inches by 3 inches. 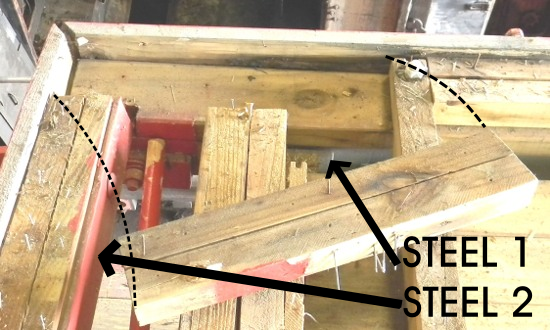 The space inside the angle iron is filled with wood, consisiting of two boards screwed together. The wood isn't there for reinforcement, but to nail the roof boards to. The wood evenly fills the arched pieces of angle iron, that is, it's flush with the edges of the steel. But the straight angle iron which runs the length of the caboose roof has additional wood on top. This wood is cut to match the angle of the roof. At this point I need a picture to explain. These next two pictures show what was a 2 X 4, trimmed lengthwise to be 1.5 inches X 3 inches. Then the board is ripped again, this time with an angled cut. If the cut is in the right place, you get the results shown in the second picture; the highest part of the shorter board is equal to the lowest part of the taller board. I didn't think of this, just copied what I think the last restorer did. Next is a picture of a corner of the cupola, with the roof boards removed. "Steel 1" runs lengthwise on the outer side of the cupola, "Steel 2" is an arched piece of angle iron that forms one of the crosswise faces of the cupola. A better picture of these steel pieces is coming on another page. 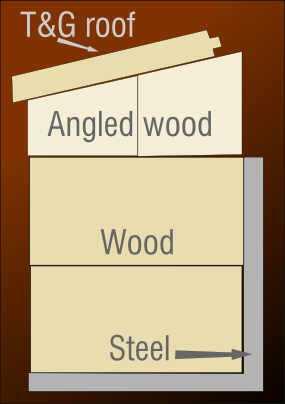 The dotted lines show where a section of the 3 inch wide angled additional wood described above has been removed. I'm not sure why the facia boards separated at the mitre corner. The next picture is of the same corner of the cupola, showing the facia board where part of the hand rail bolted on. The picture didn't show how badly the wood has been smashed and compressed where the bolt goes through. The Knoxville area has an abundance of trees, and it is assumed that the handrail collided with a branch. Since the picture didn't show the damage well, I added a white line to emphasize it more. My plan is to bore the bolt hole larger through the wood, then put a piece of steel pipe around the bolt. That way, when the handrail encounters another collision, the impact will be passed through the pipe to the arched angle iron (steel 2 ), and the wood facia board won't be damaged. Below is a picture of the arched angle iron on the end of the caboose, it's the same as what's on the cupola, save for a slight difference of radius.